The driving force of the long and explosive volcanic history of Yellowstone may not be as deep as it once was. A new study suggests that instead of a hot mantle flame that extends to the core of the Earth, the real culprit is a subduction tectonic plate that began to fall under North America hundreds of millions of years ago. Computer modeling shows that the movement of broken remains of an ancient Faralon plate could interfere with the mantle in such a way as to feed Yellowstone, researchers report in an article published in the journal Nature Geoscience, authored by Lijun Liu, a geodynamicist from the University of Illinois at Urbana-Champaign. 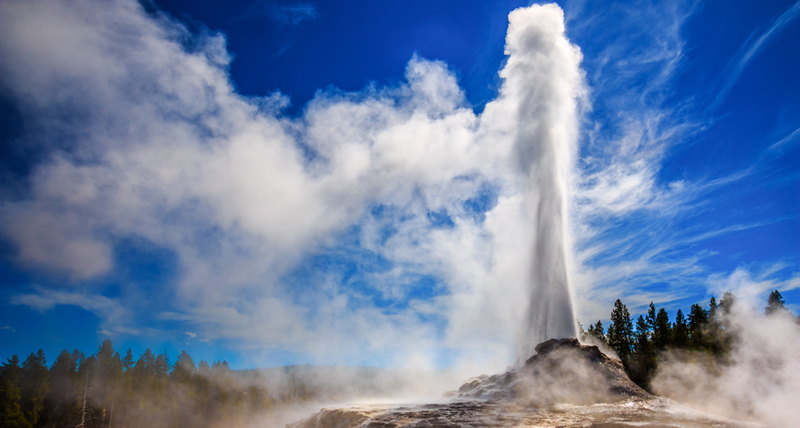 The giant super volcano under the Yellowstone National Park, located mainly in Wyoming, has a 17 million-strong history – most of it in constant motion. At that time, the locus of volcanism moved northeast of southwestern Idaho to its present location, where it most recently flared up about 640,000 years ago. These shear eruptions created a track of volcanic craters, similar to those created by a hot spot that constituted the Hawaiian chain of islands. As a result, scientists have long suspected that a deep magma loop originating from the core-mantle boundary, similar to the one that feeds the Hawaiian volcanoes, is the source of Yellowstone’s fury. But the nature of the Yellowstone plume was the subject of debate. “Usually with plumes, we can trace them to the boundary of the mantle core,” says Robert Porritt, a seismologist at the University of Texas at Austin, who did not participate in the new work. To “see” the structure of the Earth, seismologists use a method called seismic tomography, which displays an internal space using seismic waves created by earthquakes. Especially hot or liquid parts of the mantle slow down some seismic waves, known as shear waves. Tomographic images of mantle plumes, such as near Hawaii, show a region of low velocity that extends right up to the boundary between the mantle and the core, about 2900 kilometers below the Earth’s surface. It is believed that such deep plumes are necessary to provide sufficient heat for volcanism. “But in Yellowstone we do not have such a high speed with a low shear rate at the core and mantle boundary,” says Porritt. Modern images show that the area of ​​low-speed material has a depth of at least 1000 kilometers, but there is a deeper plume. And the region is tectonically complex. About 200 million years ago the tectonic plate in the west, known as the Farallon slab, began to slide east below the North American plate. The current plate of Juan de Fuki from the Pacific northwest coast, one of the last remains of the Farallon plate, continues to slide under the western United States. Some researchers have suggested that instead of a deep mantle plume, the bending and melting of the subduction plate of Juan de Fuki is responsible for Yellowstone volcanism. The Phal- lalon plate began subducting eastward below the North American plate hundreds of millions of years ago. The youngest part of the plate, called the plate of Juan de Fouca (green), now partially lies under the western United States. In the new study, simulations suggest that the descending pull of the ancient Faralon plate (blue) moves the flow of hot mantle from west to east. As this hot mantle (dark orange) rises through the breaks in the plate of Juan de Fouca, some mantles circulate to the west, filling volcanism in the pool area and the area. And some are flowing to the east, filling Yellowstone. The researchers created a complex series of simulations based on supercomputers to try and find a better scenario that corresponds to three known known: current tomographic images of the subsurface beneath the western United States; the history of volcanoes in Yellowstone, as well as in the nearby areas of the basin and ridge; and the motion of the subductive plate from about 20 million years ago. 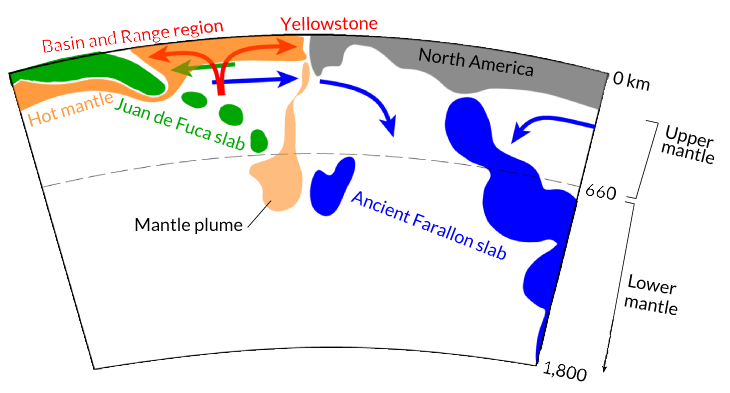 Yellowstone volcanism is associated not only with the current subduction young plate of Juan de Fouca, but also with the remnants of its more ancient incarnation, the Fallallonian plate. These remains continued to slide deeper and now lie under the eastern United States. This descending immersion dragged the hot robe to the east along with it. When the plate of Juan de Fouca began to grow under the western United States, the hot mantle rose through the cracks. Part of this hot mantle circulated back to the west through the top of the plate of Juan de Fuca, filling volcanism in the pool area and the ridge. And some of them flowed to the east, adding fire to the fire of Yellowstone. The study does not exclude the presence of a deep magmatic plume, but suggests that such a plume plays a small role in Yellowstone volcanism.